At Hampton Roads Executive Airport (KPVG) we offer both 100LL and Jet A aviation fuels, and guarantee great service with quick turnarounds while you wait in our comfortable waiting area with access to fax/copy machines. Our friendly staff can assist you in arranging hotel and rental car reservations or offer a complimentary Lexus or Ford Excursion courtesy car when available. Home of the Lode Burger and the Mile-High Club, Blue Skies Grille is a great place to relax and enjoy while you wait. Bring the family and have lunch while watching the airplanes. Kids of all ages will love it! If you need catering, call ahead and Blue Skies Grille will load your plane with delicious made-to-order specialities. In times of dangerous weather or multiple night stays, we have inside hangar storage available for moderate nightly fees, and if your aircraft needs servicing, the multiple on-site engine and avionics businesses can assist with immediate needs. KPVG is a full service affordable fun stop for pilots and aircraft of all levels. 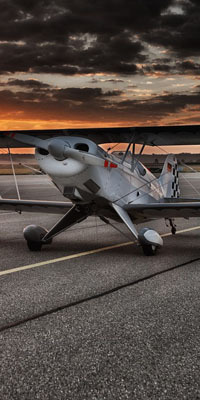 KPVG positively impacts the local community through its support of aviation businesses based at the airport - flight schools, aerial photography, aviation maintenance and avionics, banner tow operations, corporate and business aviation activities, and recreational aviation. Please see our Tenants page for more information.